We invite you to scroll to the right below to learn more about the history of Ermitage. Out of the rubble of WWII, Ermitage founder Anne Marie Thommeret creates a small school to welcome the children of Maisons-Laffitte. 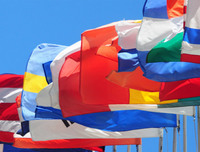 From its very beginnings, Ermitage demonstrates its commitment to intercultural learning by sending students to Austria, England, Ireland, Spain and the USA. Under the leadership of Christopher Hunter, Ermitage further develops its international ethos and implements bilingual education throughout the school. Ermitage initiates exchanges with schools in Amherst , Massachusetts (USA), marking the beginning of a long and fruitful linguistic and cultural partnership. See our Student Exchanges today! Ermitage pioneers the American musical in France! Students sing and dance in Dracula, the Wolfman’s Wedding and the Wizard of Oz. Ermitage also stages Benjamin Britten’s ambitious oratorio “Noye’s Fludde” at the St Augustin Cathedral in Paris. Ermitage organizes its first annual Christmas Ball at the Château de Maisons-Laffitte. A few years later, Ermitage hosts its very first Prom! Ermitage joins Round Square, a prestigious organization of international schools, giving its students further opportunities to explore, study and serve abroad. What is Round Square? 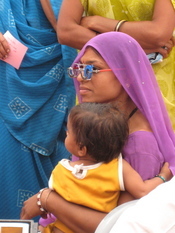 Ermitage travels to India to implement ICU2, an ambitious service project providing free eye care to underprivileged children and adults. See how our Service Projects have developed through the years. 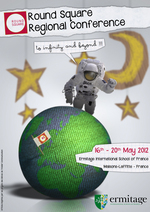 Ermitage introduces the OIB, and, moving ever-forward, launches the International Baccalaureate Diploma program. Visit to Learn more. Ermitage students attend their first Placitum, and learn to communicate and share openly with their fellow students. Ermitage hosts its first Annual Round Square Youth Conference; Ermitage students host 60 students from 10 different schools for an eye-opening intercultural learning opportunity. Learn more about our Leadership Conferences. Ermitage celebrates its 70th anniversary, renewing its pledge to helping all students develop into successful, open-minded, open-hearted citizens of the world. Interested in learning about more ermi-news? In 2012, 100% of Ermitage seniors from all diploma programs graduate, many with high honors.